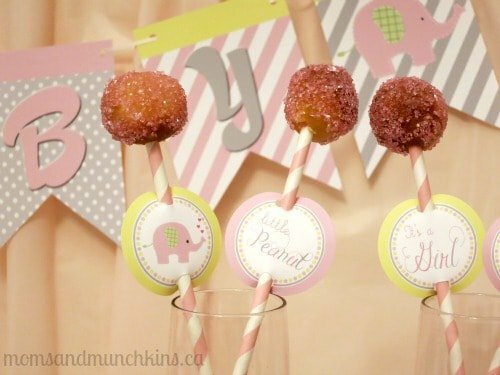 A baby elephant theme is such a cute idea for a baby shower. It’s a theme that is gender neutral and it can be mixed with additional themes such as a Circus Elephant; Thai Elephant or Jungle Elephant. 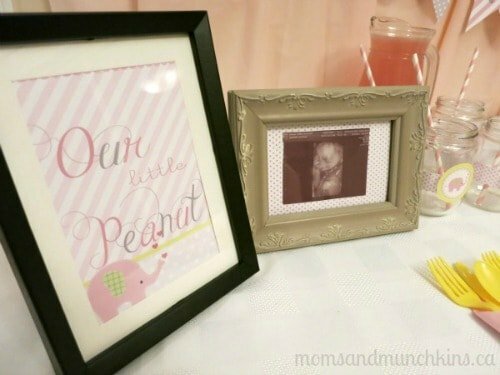 Here I’ll share general elephant baby shower ideas for a baby girl that can easily be modified for a shower for a little boy. 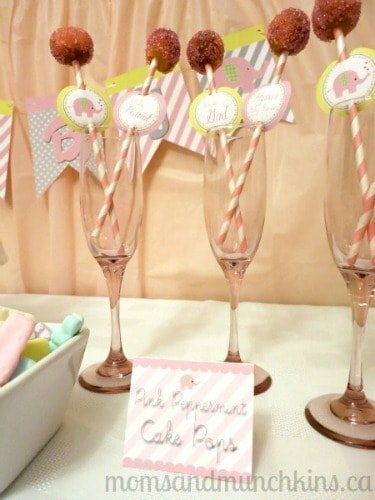 All of the printable party supplies featured here are by Just a Little Sparkle. 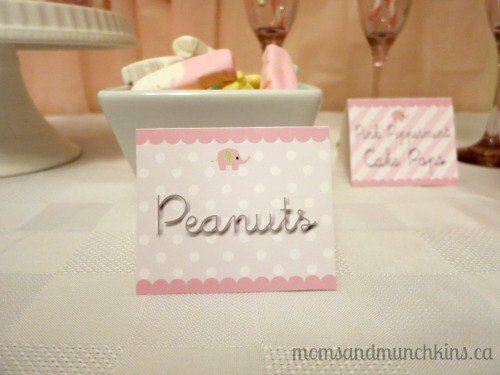 Elephants love peanuts so an elephant baby shower could include wording like “our little peanut”. 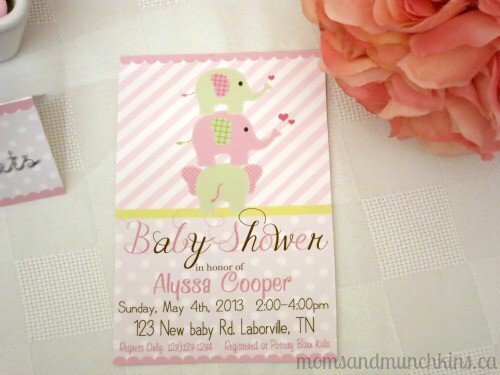 We all know that elephants have really big feet so a cute twist on an elephant invitation would be to talk about your child’s tiny toes. There are many ways to incorporate cute wording into your invitation or you could stay cute & simple with elephant images on the invitation. For any type of elephant theme, grey is an excellent accent color. 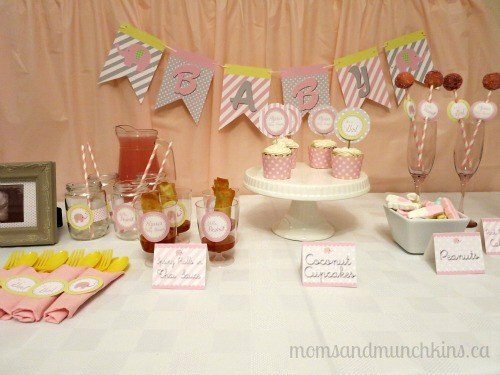 For a baby shower for a little girl, grey and pink colors can be incorporated through a banner, tablecloth, balloons, backdrop, tissue balls, napkins, utensils and more. You can also use these colors in a variety of prints like floral, chevron, polka dots, stripes and more. Pair the circle with a ribbon and create napkin rings. 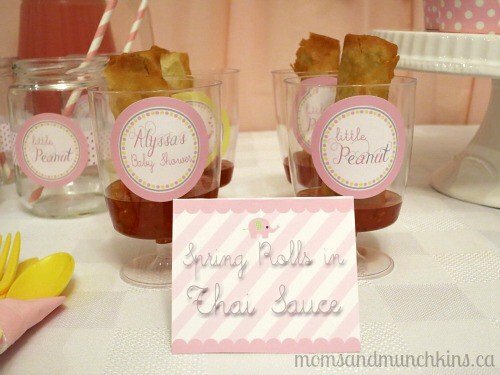 A thin strip of patterned paper and a cupcake circle can be placed around mason jars filled with pink lemonade. Using a single hole punch, punch a hole in the top and bottom or the circle and then thread a paper straw through it for cake pops or drinking straws. 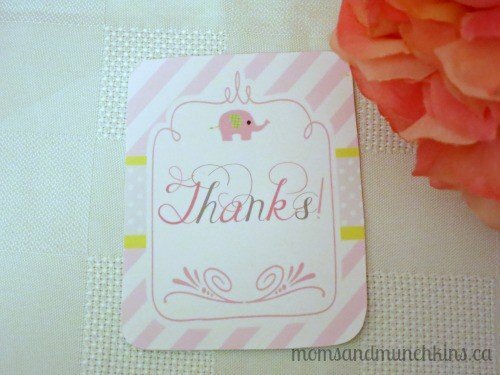 Print some on sticker paper and use these as a seal on the invitation envelopes. 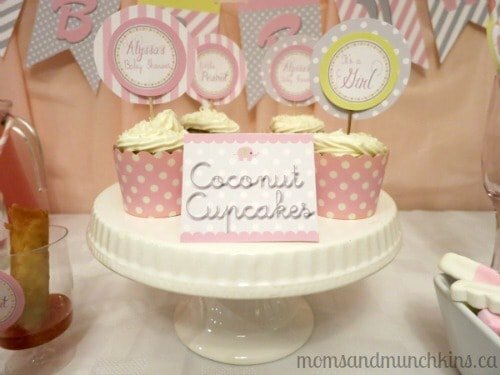 Candy vases and porcelain cake trays are beautiful decor pieces that you can use again and again at parties. 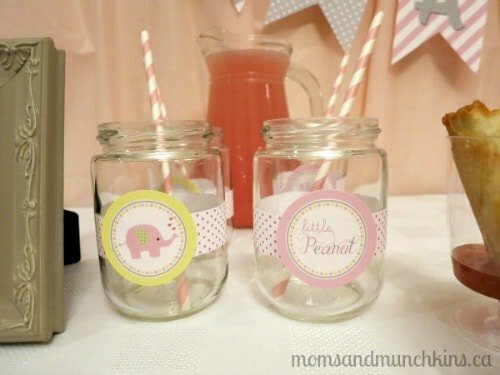 Pink lemonade in mason jars is a cute idea for a baby shower for a girl. Other ideas include sparkling juice in champagne glasses or a tropical juice bar. I always prefer food or practical items for party favors. 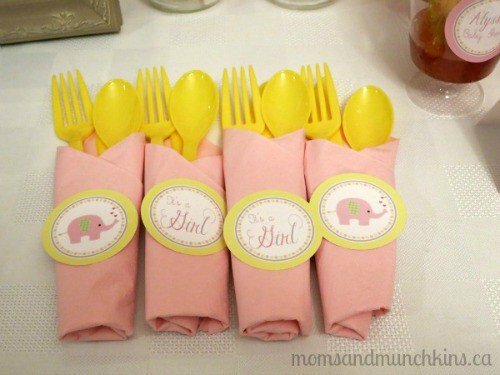 For an elephant themed shower you could include small takeout boxes of a tropical trail mix (chocolate macaroons, dried pineapple, peanuts, shredded coconut, etc.). We’re always adding new ideas for all types of celebrations. Never miss an update by following along on Facebook, Twitter, Pinterest and Bloglovin’. Disclosure: Just a Little Sparkle provided the printable party package to Moms & Munchkins free of charge. I am a part of the Amazon affiliate program. All opinions expressed here are my own. Thank you, Angie! I hope you are having a fabulous week as well!